Finding the right white balance in Milky Way and astrophotos can be challenging, so here are a few simple steps to make that process a world easier. Colour in photography can be subjective and independent to every photographer and is an element of developing a style of photography. 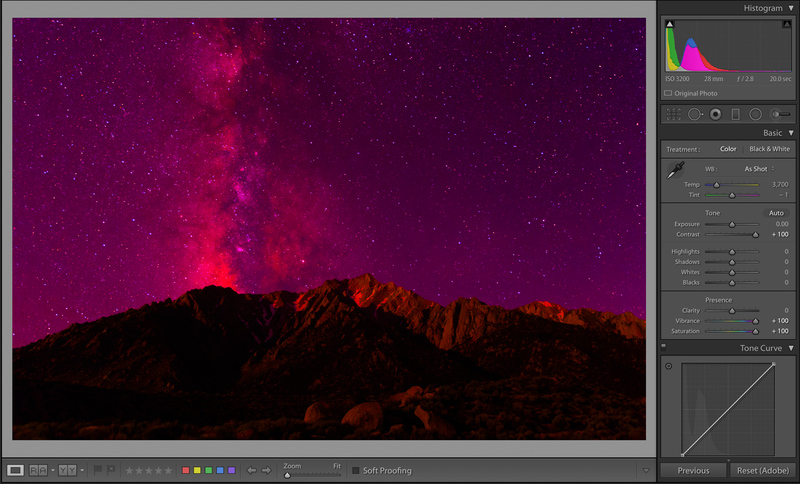 Personally, I like a very neutral sky and a warm/magenta milky way; but everyone will have their own taste. Starting out in astrophotography though, you may want an efficient way to gain a balanced sky before you start to play around with colour, so this is a simple way to achieve that. Below is a step by step Lightroom process for achieving a colour neutral sky, followed by a Photoshop method if you’re struggling to gauge minor colour tweaks. Bring your RAW file into Lightroom. For this example, I’m using Lightroom Classic CC. 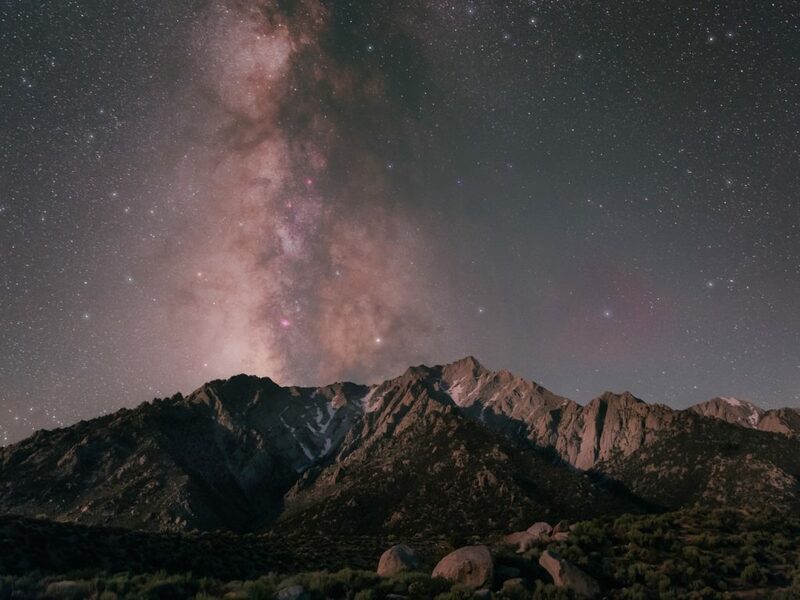 This shot is of the Milky Way above Lone Pine Peak from California’s Alabama Hills. 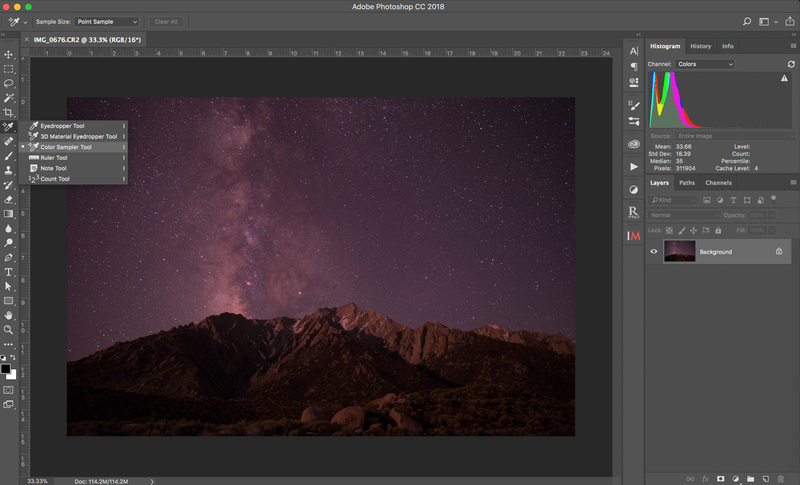 I shot it with a modified Canon 6D, which is why the raw file has that magenta tint. The Raw File: 28mm / 20s / f2.8 / ISO 3200. Next, slide the Contrast, Saturation and Vibrance sliders all the way to +100. It will be a pretty ghastly sight at first, but we want to exaggerate all of the colour in the image to balance it. 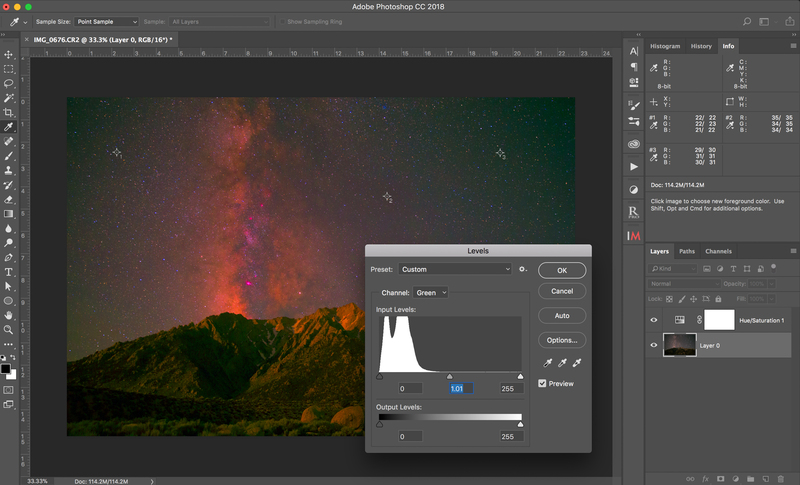 Now start tweaking your white balance. 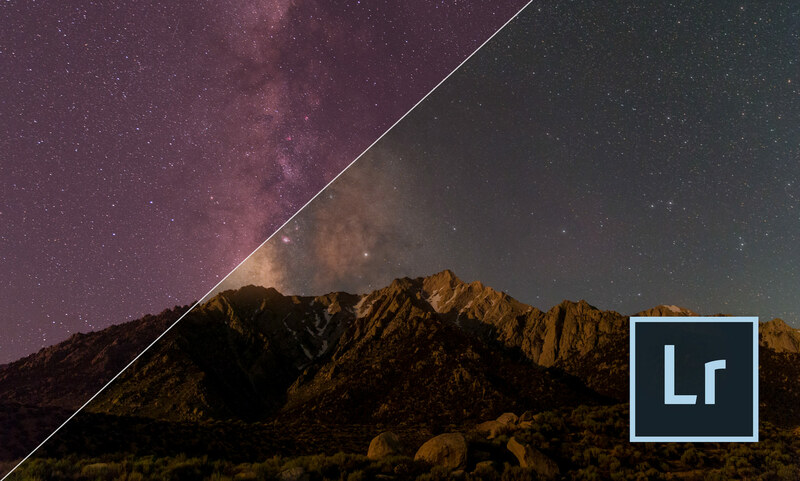 You’re looking to reduce all the colour and tint in the dark sky, so focus on the darkest sky in the image and use that as a reference to adjust. 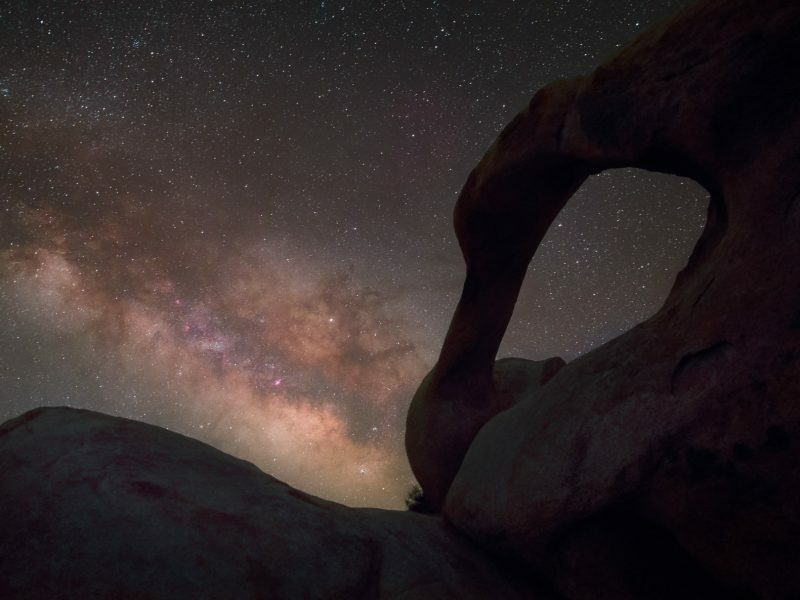 Ignore any skyglow or light pollution that might be in your photo, we want to judge the colour based off of the part of the photo which should have the least colour information. 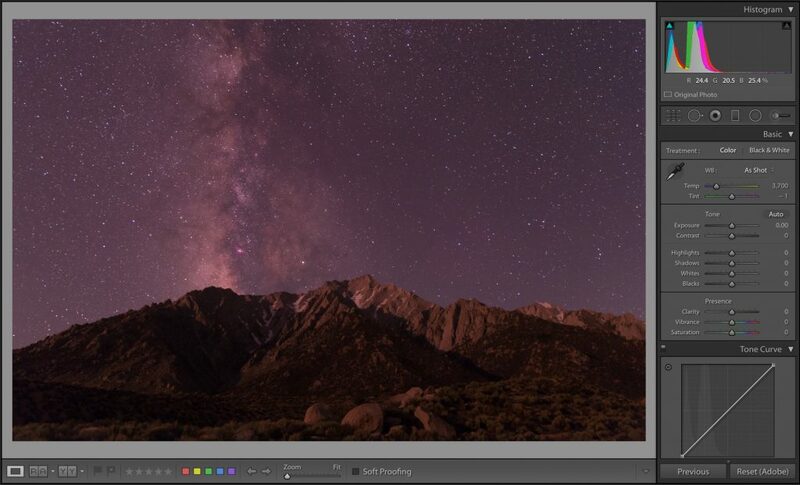 You want to start to balance the colour by working the temperature and tint bars, so if the image has too much yellow, move the temperature bar towards the cool end. If it’s looking too green, move the tint bar toward magenta. 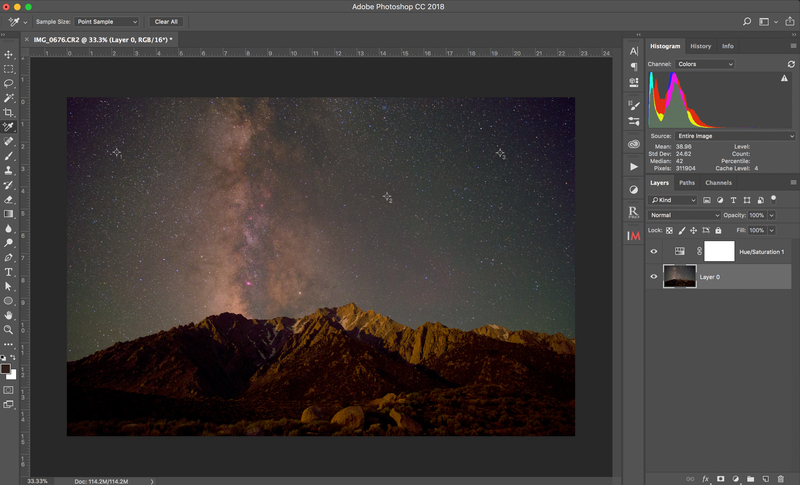 You’ll quickly get used to working these two sliders to find a balance where the background has minimal colour. You can also use the histogram to help you here, as all we’re aiming to do is to stack the colours together as close as we can, and if you see the difference in the histograms in the two previous examples, you’ll notice how the colours have come together. Reset the Contrast, Saturation and Vibrance sliders back to zero, and you’ll now have an image white balanced to the sky. 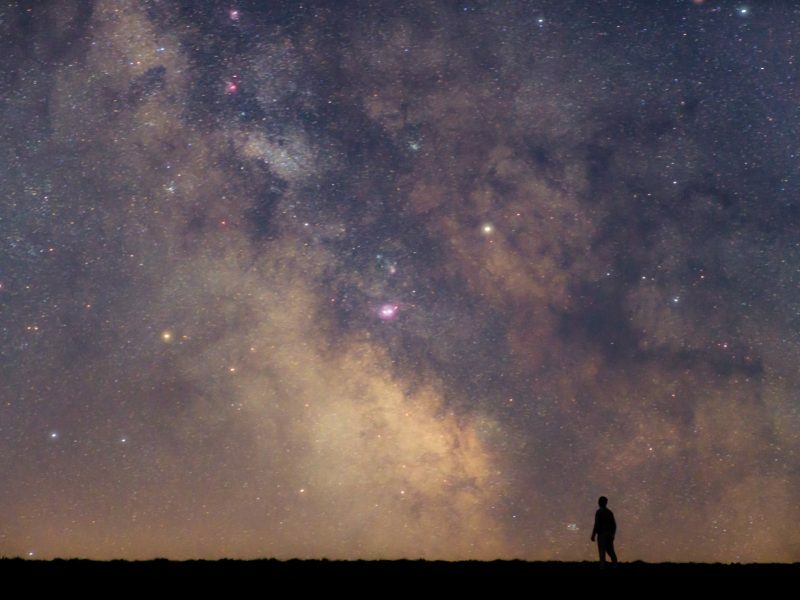 It’s important to note that the colour of the night sky isn’t a constant; atmospheric conditions, Aurora, light pollution, weather and airglow can all play a part in what colour the sky appears. 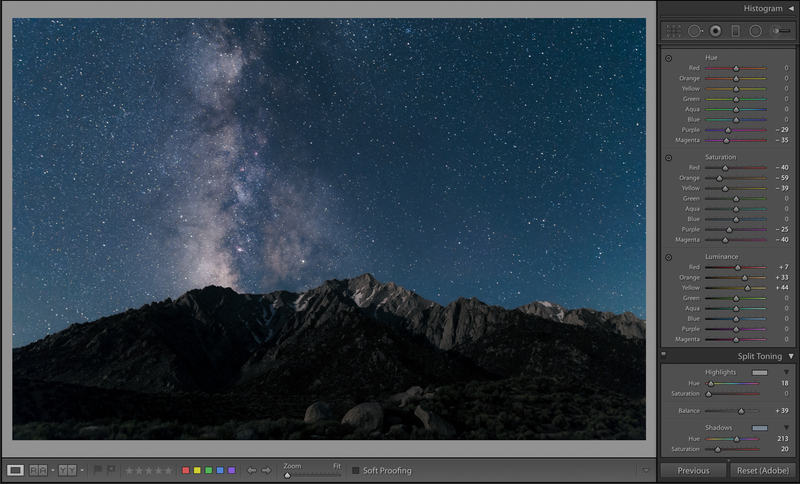 You might find you still retain or account for this colour when you adjust your white balance, otherwise, you can readjust throughout the rest of your processing workflow. Roger Clark wrote a very extensive explanation of these variables here if you want to read more. Resetting all of the contrast and saturation adjustments. Below is my final processed image of this scene. As you can see it’s developed a lot since the balanced RAW file, but I still used the above theory to achieve a reasonably accurate colour in the night sky. Depending on your artistic direction or taste, you might want to make further adjustments to your image. You can use the temperature and tint sliders to bring the image toward a particular colour, or we can use split toning and HSL in Lightroom and take things a little further. Below are some further examples of how we can transform the feel of the image with a few tweaks in HSL. We can use some general understanding of colour in photography to achieve some different results. Left: Here I’ve increased saturation in the yellows and reds to enhance the colour in the Milky Way, and used split toning to add teal in the shadows of the background night sky, and adding a warm red to the highlights of the Milky Way. This gives that orange/teal colour split which is quite popular as a complementary colour palette, and you see this a lot in movies (check out Mad Max’s colour grading). 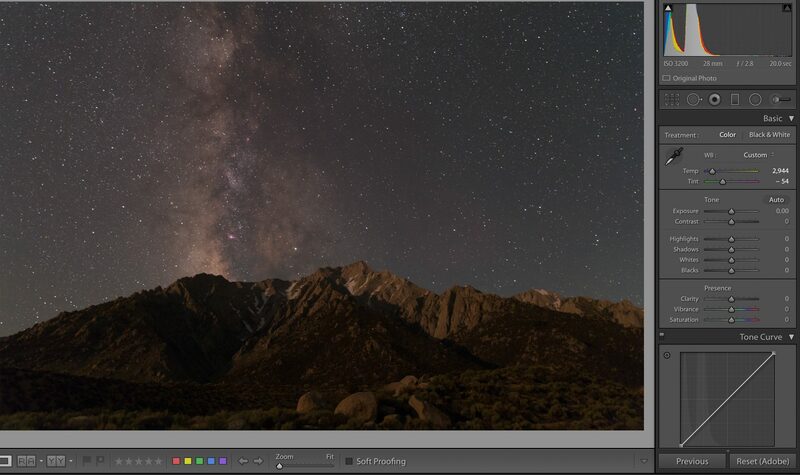 Center: Here I’ve created a cooled version of the image, using the temperature to make the balance bluer, HSL to desaturate the warm tones in the Milky Way and mountains, and used split toning to cool the shadows even more. 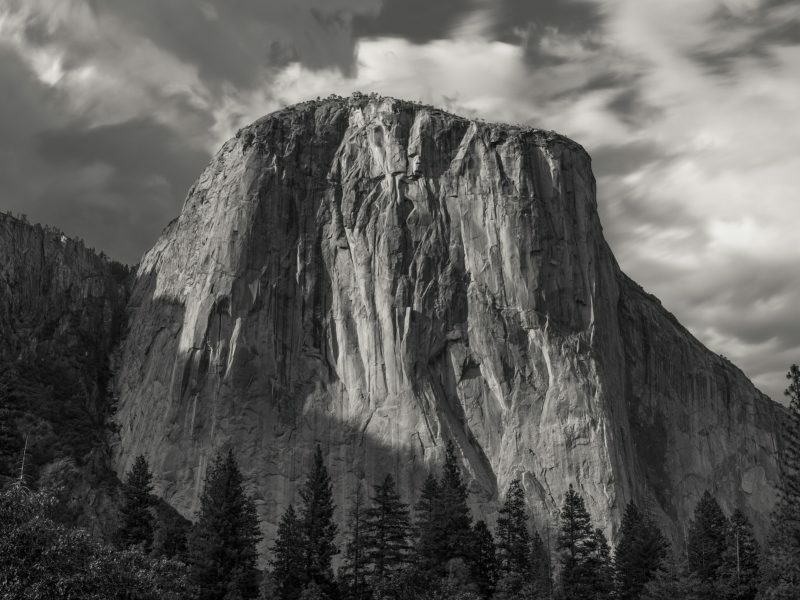 This results in a more monotone image. Right: In this example I’ve created a warm example, simply by warming the temperature and bringing the Milky Way tones more toward the red. If you haven’t got Lightroom or just prefer editing in Photoshop, you can technically make the exact same adjustments using the various colour adjustment options in Photoshop. Alternatively, there’s an option to use the Colour Sampler tool to achieve a balanced background colour. 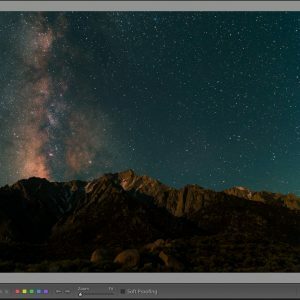 This can be handy if you’re struggling to judge the colour and make the tone changes in Lightroom, as the colour sampler method relies on a technical readout rather than your eyes to assess the colour of the image. I first learned of this method for deep sky astrophotography, where combining RGB monochrome images resulted in full colour results. To achieve this, it was important to use an accurate way of balancing colour between the image’s colour channels. First off, import your RAW file into Photoshop and select the ‘Colour Sampler Tool‘ from your tools menu. 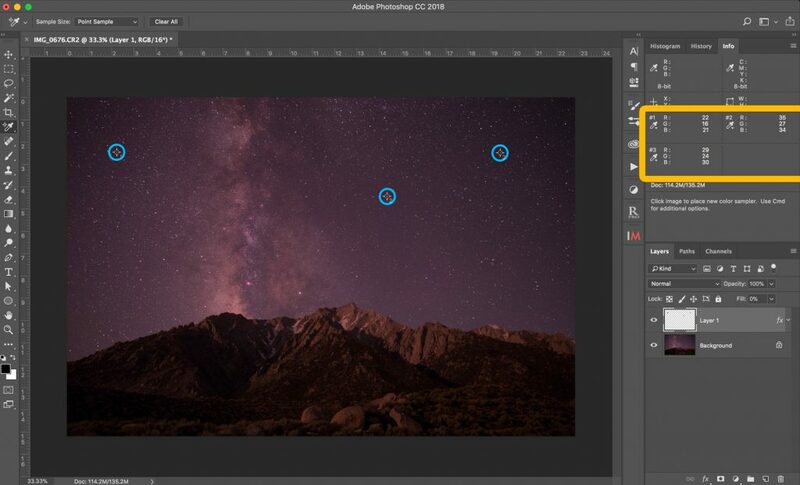 Next up, use the tool to select three points on the image. 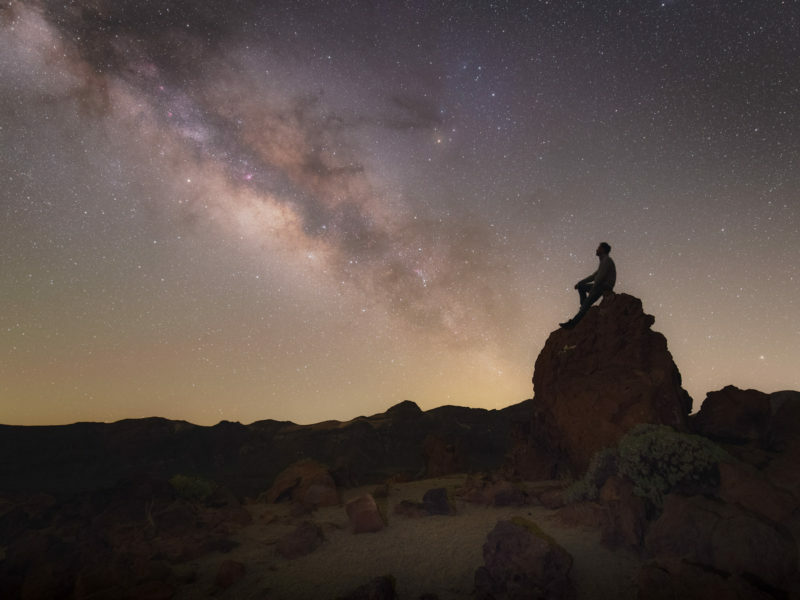 Try and pick the darkest parts of the image away from any glow or light pollution nearer the horizon. This will help eliminate any anomalies in the readouts of the colour sampler. 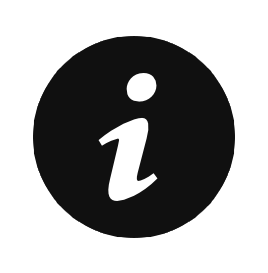 Now open your ‘info’ panel view if you haven’t already, (go to Window > Info to activate it). In this view, you’ll see the readouts from your three colour samples (see the orange box below). These give you an RGB reading of the pixels in your colour sample points. If the pixel was completely black, they’d all read zero, if it was a completely white pixel, they’d all read 255. We can use these numbers to determine the colour balance of that part of the image, assuming we’re aiming for a completely colour-neutral sky. 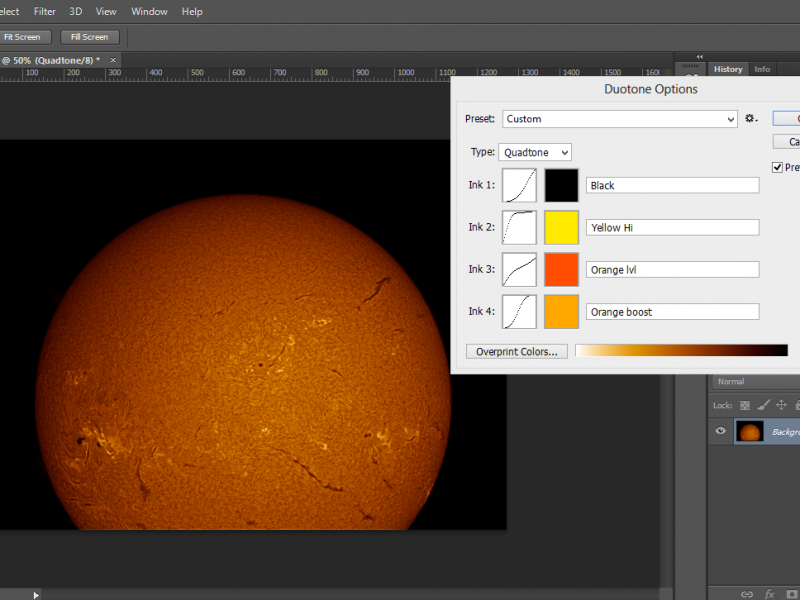 Add a new Saturation adjustment layer in photoshop (Layer > New Adjustment Layer > Hue + Saturation), this won’t massively assist the colour sampler readout, but it will give you a better colour visual reference as you work on your colour. Now open your ‘Levels‘ in Photoshop (Cmd/Ctrl + L) and use RGB drop down to select the Red, Green or Blue channel depending on which you want to adjust. By reading the sample information from the ‘Info’ tab, we can determine what colour needs to be balanced. For example, in my image, the Green data is lower across all the points – R: 22 / G: 16 / B: 21. 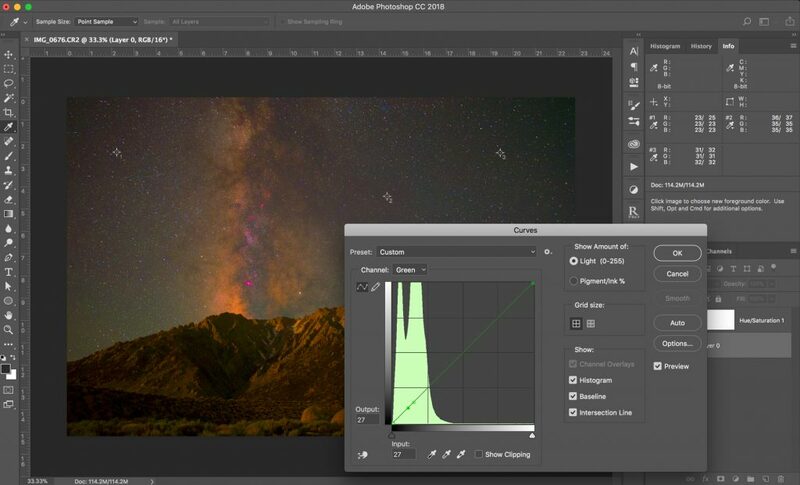 In this instance you would use the green channel in levels to stretch the histogram, effectively brightening the green channel. Go back and forth making adjustments until your readouts are near equal as they can be. They don’t all have to be exactly the same, and your sampled pixels won’t be exactly the same colour, so the aim is to get them all as close as you can. If you’re finding that some parts of the dynamic range of the image have a funky colour tint, you can use ‘Curves‘ (Adjustments > Curves) to tweak the colour balance between your colour samples. You can select the colour from the RGB dropdown, and hold down Cmd/Ctrl + Click on a specific area of the image to fine-tune its brightness.